Lori Hairston: Welcome to the Vintage Valentine Card Party! 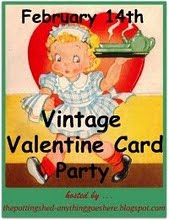 Welcome to the Vintage Valentine Card Party! Happy Valentine's Day and welcome to the party! 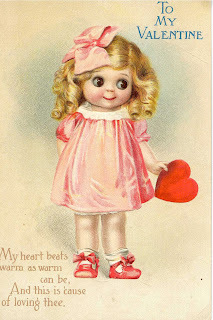 I've posted a couple of vintage valentines from my collection. Feel free to use them in your paper art. Both of them were purchased here in OKC at an antique store we frequent. 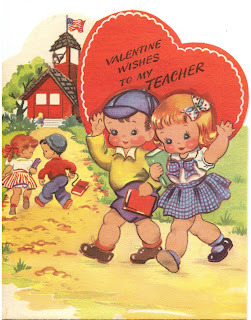 I love vintage valentines! Just looking at them gives me joy! I'm also having a give away. Have you ever purchased two of the same thing? Amazingly, I've done it more than once! Anyway, several weeks ago I was opening things I had purchased from Michaels (two separate trips), when I noticed I had two of the same Martha Stewart heart punch. Good grief...couldn't even remember purchasing the first one! The one on the left I've been using...the one on the right hasn't been used at all. I would like to give it away. If you're interested in winning my extra Martha Stewart heart punch leave me a comment and I'll randomly pick a winner. Since Joan is leaving the links up for a week, I'll post the winner next Sunday. Thanks for sharing such sweet valentines! I snagged the first one! I would love to win your forgotten punch too! Happy valentine's Day to you and yours, I hope it's a great day! Cute cards. I really like the second one. I only have a couple of Martha's punches, and I'd love a chance to win the heart. Please sign me up! Count me in, I'd love to have the punch. Also, your cards are adorable, and thank you for sharing them. I'd love to win that 1...I'm hoping those go on sale tomorrow at Michael's. that makes the sweetest heart punch out. That first Valentine is the sweetest thing!! Loved it! What a neat giveaway...I'd love to be entered! Have a great Valentines Day! Adorable cards, thanks for sharing! I would love to win the punch! Happy Day! Thanks for sharing Valentine cards! Love to have a chance at winning the punch. thanks!! Love the card with the girl whose eyes are huge. Such wonderful old graphics! And the links will be up and i hope lots of people come to enter! Don't worry I have done the same. That is what happens when you let your sewing room become such a mess that you don't know what you have. Honestly, each time I clean it up, I am truly amazed at what treasures I actually have. Please sign me up for your giveaway. I don't have that heart punch. What a beautiful punch! I'd love to win it. Oh my goodness the little googly eyed girl is so darling! Thank you for sharing her! New cards and a winner! Rain or Shine...You're Mine, Valentine!